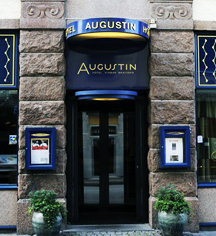 Built in 1909, Hotel Augustin is a colorful Art Nouveau hotel owned by the Smørås family. Originally a local watering hole, Hotel Augustin has taken many forms before becoming the luxury Norway hotel in charming Bergen, the inspiration for Arendelle, the home of Anna and Elsa in Disney's animated film Frozen. Offering 113 spacious and comfortable guestrooms and suites, Hotel Augustin takes pride in its variety and excellent hospitality. Decades of expansion, restoration, and renovation has allowed the hotel to incorporate old neighboring houses and buildings as new wings. Recent modernization has allowed guests to enjoy both old-fashioned hospitality and convenient amenities and technologies. Passionate about food, Hotel Augustin's Brasserie No22 has a modern rustic interior serving decadent plates with comforting flavors and ingredients. Amenities and services at Hotel Augustin include the popular tavern situated in the 400-year-old cellar, several meeting and banquet rooms, and several dining options. Hotel Augustin, a charter member of Historic Hotels Worldwide since 2012, dates back to 1909. During the 17th century, Hotel Augustin, named after St. Augustine, was originally a local tavern, Altona Cellar, with hostel rooms for travelers. 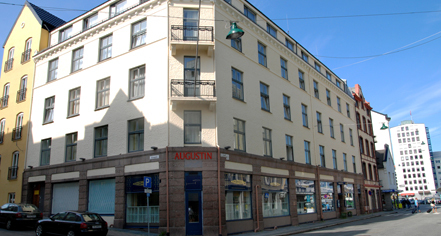 Built in 1909, Hotel Augustin is a colorful Art Nouveau hotel owned by the Smørås family. Originally a local watering hole, Hotel Augustin has taken many forms before becoming the luxury Norway hotel in charming Bergen, the inspiration for Arendelle, the home of Anna and Elsa in Disney's animated film Frozen. Learn more about the History of Hotel Augustin .